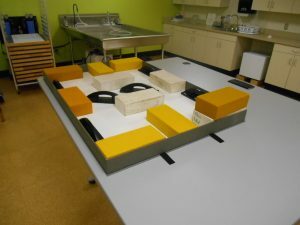 My love of extreme things (extreme sports, extreme reality television) has led me to create a two part blog series: EXTREME ENCLOSURES. In part one, I will detail the creation of four Andre-the-Giant-sized cloth-covered telescoping boxes for our cherished Audubon’s Birds of America. Part two will chronicle the construction of corrugated clamshell boxes (aka “drop spine boxes” or “pizza boxes”) for the few hundred miniature books held by Rubenstein Library. Those are some BBB’s (big, beautiful books). Audubon’s Birds of America is a four volume set of double elephant folios containing life size prints made from engraved plates. 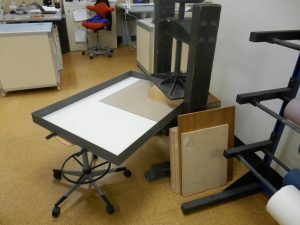 Each volume has a footprint of around 40 inches x 27 inches, and weighs around 47 pounds. When making an enclosure for a book this gigantic there are a few things to keep in mind: the weight of the item after boxing, and the area of the materials needed to construct the box. Measures need to be taken to ensure the box itself isn’t too heavy. Per Beth’s suggestion, I used double-walled corrugated board for the bottom tray. 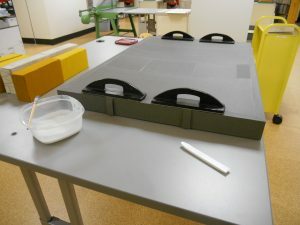 Double-walled corrugated board would lend adequate support while also being significantly lighter than a tray made of double walled binder’s board. One problem: the sheets of double walled corrugated are not large enough to create a box this big. 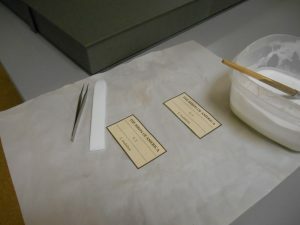 Using a micro spatula, I peeled one layer off each sheet and laminated two sheets of corrugated together with a Polyvinyl Acetate (PVA) and Methyl cellulose mix. 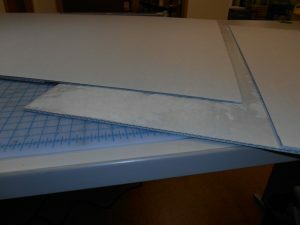 Peel one layer off the bottom of the top sheet, one layer off the top of the bottom sheet. Keep adequate weight on the sheet while it dries so as to avoid warping. 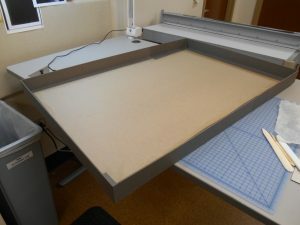 Once the sheet is dry I can construct the bottom tray and cover it with cloth. 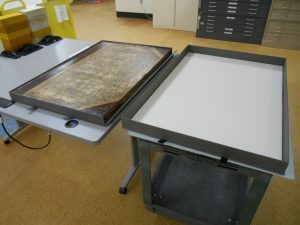 I chose a tray that had three fixed walls and one collapsible wall that would facilitate removal of the book. 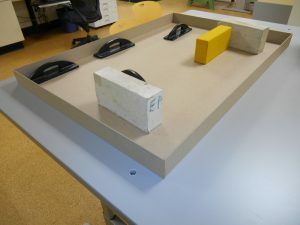 Working with wet adhesive and corrugated board was the most frustrating step of all. Unlike binder’s board, corrugated will buckle under pressure from my bone folder. When adhering the cloth, I had to be very careful of how hard I pressed. A ginger touch was key. The corrugated also felt unstable while the adhesive was wet. The inner corners of the tray were especially wonky after getting all the cloth laid down, making me feel as though all was lost. 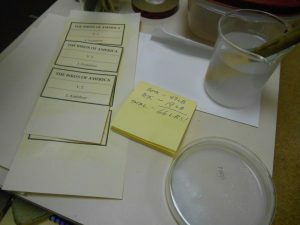 This wonkiness did, however, subside after adequate time had been given for the adhesive to dry. Once dry, the tray was remarkably strong. ‘Tis a rough road, the path of the corrugated…one might even describe it as extreme. Moving on to the top tray was a reprieve. What a cake walk! 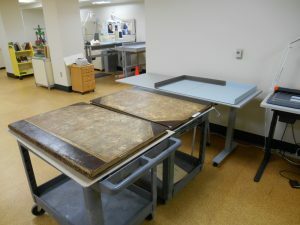 The top tray was constructed like any cloth covered box; a single wall of binder’s board. The cloth stuck to that binder’s board like a Californian on a skateboard. The main challenge was adhering large swaths of cloth consistently to avoid air bubbles. This step was such a cake walk, I had to keep myself from imagining these bricks were cakes. If I flipped the whole tray over, it resembled an oversized sheet cake. 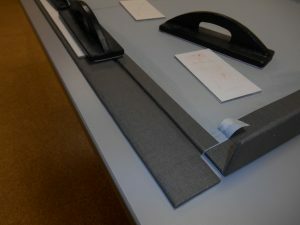 Next I created Velcro tabs to adhere in between the tray and the outer lip to keep the top and bottom lids securely fastened when the box is handled. I lined the Velcro with book cloth and shaved down the Velcro parts that would be placed in between the tray and the lip to reduce their swell. Making sure the Velcro strips stayed stuck to the tray was an issue. The PVA often had trouble keeping the plasticized Velcro in place, making it easy to dislodge the strips. I found that once the lip had been firmly adhered, the strips stayed in place. 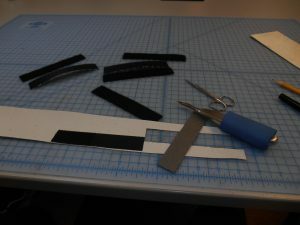 Lining and shaving the Velcro strips. Adhering Velcro before adhering outer lip. Next comes adhering the outer board to the tray. 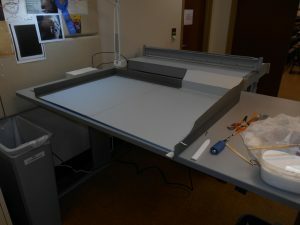 Because this behemoth would not fit in any of our presses and the area of the tray was impossible to adhere in one go without adequate pressure, I resorted to a multiple-step-adherence-approach. 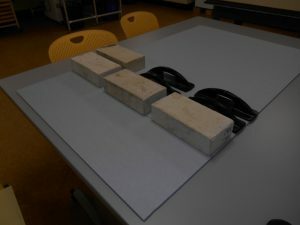 I used brick weights for an initial gluing. Once dry, I had to re-glue each corner, one at a time, and place each corner into the press with blocks. 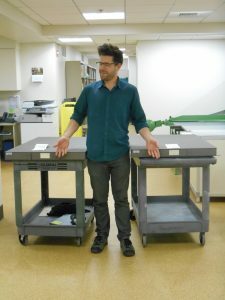 I rigged up an extreme support system for the tray while in the press: a stool. And finally, the finishing touches: labels. Like an expertly landed kick flip. Upon fitting the item into the box I weighed the item with its enclosure. It totaled a whopping 66 pounds. 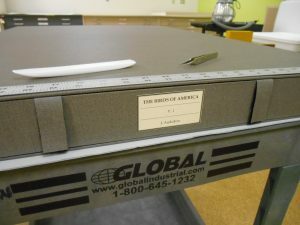 The book weighed 47lbs, and the box 19 pounds. Saving a bit of weight on this box kept us from reaching into the twenty-pound range on the enclosure alone. It fits! No meltdown needed. But alas, we must always say goodbye. In extreme circumstances, I prefer to keep my eyes closed so as to avoid crying. The Audubon’s have settled down in their new homes. Although they continue to amaze visitors of Duke University with their awe-inspiring depictions of the Birds of America, their bindings are no longer at risk in un-enclosed spaces. Stay tuned for Part Two of Extreme Enclosures: Extreme Miniatures. Awesome, Tedd! Thanks for writing this blog, which I am sharing far and wide! On display in Perkins Library, Lower Level 1, Room 023. Open during regular library hours. Big Birds, Dragons, and Gardens…Oh My!